Earlier this year, Penguin Books published ‘First Light’, a tribute to a novelist who has lived and worked continually on ‘the Edge’. An iconic writer for children in the 1960s, his work quickly moved to the outer limits of that literature, and since then his novels have been ever more challenging, strange and beautiful. From the haunting ‘Owl Service’ to his gorgeous ‘Stone Book’, I’ve been a fan of Alan Garner’s for a while and it’s great to see his unique and daring work recognised. Young readers have loved his work since 1960 and his first novel, ‘The Weirdstone of Brisingamen’, which first introduced his key subject – a very specific Edge in Cheshire. It was his first novel, published all the way back before folk horror was invented, in 1960. I’m very fond of my Puffin edition, with its cover by George Adamson. Not so much for the image of Durathror and his strange cloak, but the back cover image: a forest of blue shadows, and a bright yellow pinprick of a distant figure lost in their midst. It’s a novel about being lost. 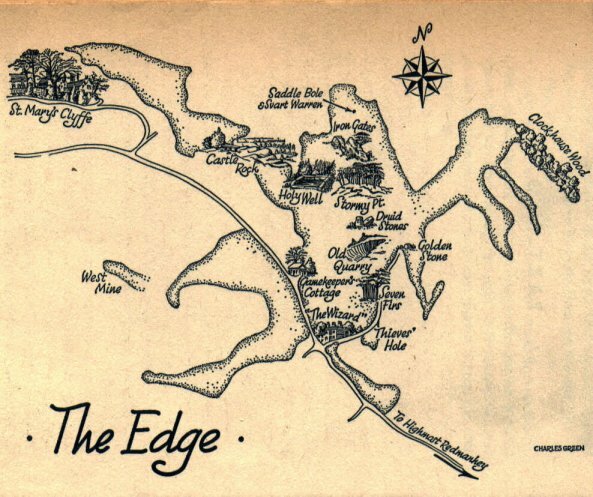 The setting is Cheshire, and specifically Alderley and its wild hills, evocatively known as the Edge. The town of Wilmslow is visited briefly, but Garner doesn’t disguise his disapproval of its suburban dwellings: where you make your home is very significant in this novel, even though we don’t really know where Colin and Susan, our young protagonists, come from. Their parents are away and they’ve come to Alderley to stay with a farmer friend of their mother’s. My boyfriend is a long-term admirer of Garner and particularly this book, and at least in part because the Edge was a place that he knew well. He comes from Wilmslow, and very nice it is too – don’t let anyone tell you otherwise. Rather wonderfully, he tells the story of being recommended the book (in the mid-1970s) by the owner of a bookshop in Alderley called The Legend, which sounds like Chapter One in a magical adventure itself. Not only that, but the power was out (like I say, it was the mid-1970s) and they had to search out the shelf by torchlight. I half-believe that Jon and his Mum were then led through a portal into a mysterious cave where twelve knights lay in eternal sleep, and he just doesn’t think I’m ready to hear about that yet. Because of course, that’s what happens in ‘the Legend’ of Alderley Edge, that a farmer from Mobberley was riding to Macclesfield Fair, and made a strange bargain with an aged Wizard whose cave he could never find again. The story of the Sleepers in the Cave occurs all over the country, and perhaps the very first note of fantasy in the novel is struck when the reader must presume a real occurrence in this real location. ‘What if’ it is told everywhere, but the only place it really happened was your hometown? The beauty of this conceit is that it’s impossible to resist – we’re halfway there already. Don’t we all innately want to believe the founding myths and legends of where we live? In South London, admittedly, I never had many local legends to believe in. The closest I got was the story of Springheeled Jack, which I read in a classroom reader at 7 or 8 – and the tale of the Bakerloo Flea by Michael Rosen, in his wonderful collection ‘Nasty!’. If you’d told me that someone got off at a ghost station on the Northern Line one day in 1932 and found a mysterious cave where twelve knights lay in eternal sleep, I’d drink that down too. Jon and his family and friends knew the territory of the Edge, the way that Gowther Mossock does, and the way Colin and Susan ought to, and knowing the Legend is part of that knowledge. But Colin and Susan get lost, and pursued by svarts and other nasties, and only survive the experience because they come to a mysterious cave where twelve knights lie – ah, you’ve heard that one. And there’s the Wizard, and his story is mixed up with theirs. Even more so when the villains come for the children, in the form of a mist which literally disorientates them. Before things can be restored to safety, the children have to disobey Gowther’s warning: they have to venture down a tunnel, to go down into the caves and tunnels under the Edge, and get themselves lost. And it’s terrifying! 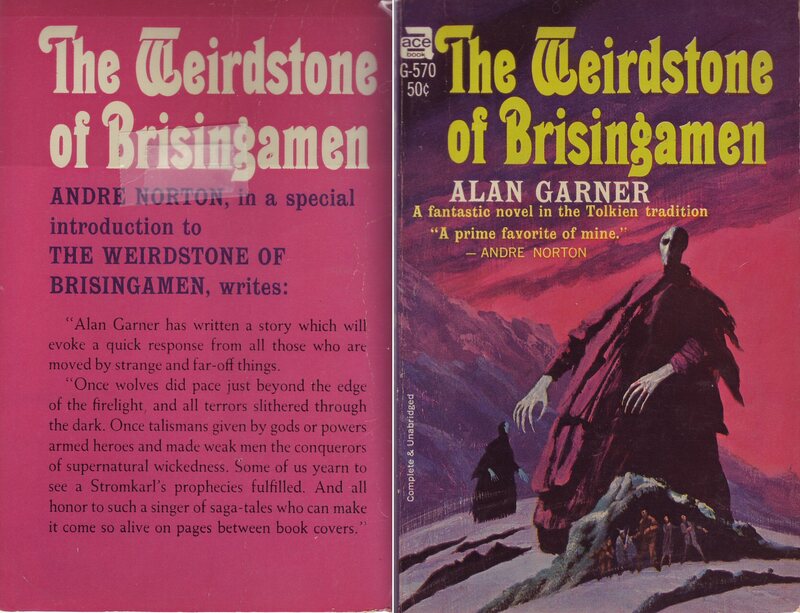 I must say, ‘Weirdstone’ isn’t my favourite Garner novel. I’m rereading them just now, for the thesis and other reasons, and I’m looking forward especially to ‘Elidor’ and ‘The Stone Book’. Colin and Susan are generic middle-class children’s literature characters, of the kind that persisted mostly until Garner came in and shook up the landscape. Their allies are slightly cartoonish Tolkien dwarfs, their enemies slightly cartoonish new versions of Abner Brown (from ‘The Box of Delights’). But the places are the important thing about this novel, and they are beautifully evocative. What’s more, everybody has had at least one experience (especially in childhood) of being despairingly lost. When it happens here it’s horribly convincing. Colin found that he had to rest more and more frequently. He thought of the hundreds of feet of rock above and the hundreds of miles of rock below, and of himself wedged into a nine-inch gap between. There are several moments of despair and resignation in the novel. It’s a tough book! I do wonder about Garner’s influences. There are some moments of MR James, but also what feels like Ian Fleming or John Buchan, transposed into the world of goblins and magic. It’s still a striking mixture, and the two strains in the novel work oddly well together: the pleasure of adventure, of cliffhangers (literally) and desperate escapes, and the serious feeling for the subject matter, that the reader responds to with a gut feeling. An imaginative exercise, but not ethereal for all that. And in between the two extremes, mediating them perfectly, absorbing all manner of stories with capacity for even more, a mix of leafy shadows with a pinprick figure straying through their midst: the evocatively, affectionately, unswervingly real matter of the Cheshire landscape. It’s not surprising that the book has not one but two maps. It’s a map all in itself.